I've wondered some about this. Would there be any reason/premium to having collectible items that are food related to still having them exactly as they were, with the product included? I still see Wheaties boxes with the cereal still in them. Why wouldn't there be a premium for such things? Oh, just imagine a 1954 Wilson Franks card still in the original sealed package, with the hot dogs still in it! Or a 1970s Hostess Twinkies card still with the two Twinkies in there! Me think the cards would be destroyed by now! And the hot dogs and twinkies??? FUGETABOOTIT!!!!!!!!!!!!!!!!!!!!!!! Last edited by Steve D; 02-12-2018 at 08:29 PM. Au contraire mon frère. I would wager that those Twinkies and hot dogs would be well preserved knowing what they are made of. In fact, I've probably still got some undigested Twinkies in my belly from the '70s. I would bet there will always be a slight (to larger) premium on unopened items to some collectors, as long as the product inside keeps well. In addition to the Cereal (I don't have any full though), I do have a couple of those 80s Kraft Mac and Cheese boxes with the cut out cards & noodles still inside. I also have a Pepsi can unopened from Michael Jackson's Dangerous Tour. The special kicker is the can was from Japan too. I also have a bunch of the Kraft macaroni boxes with the Mac and cheese still inside. I figured those contents should be inert enough to not damage the cards on the outside of the box. Last edited by GasHouseGang; 02-13-2018 at 01:47 AM. If the Twinkies are anything like the cupcakes they'll probably be fine for quite a while. I had a pack of cupcakes one day while sorting cards. Ate one, got busy, got pulled away for other stuff, forgot the cupcake. Next time I could get back to the sorting was about three weeks later. The cupcake still seemed fine. Figured I'd leave it and see, expecting mold to start soon after. Checked it occasionally........Three YEARS later when we were moving the bookcase it was on to get a room ready for my first daughter, I finally threw It away. It was still soft, still smelled fresh, and the only thing that seemed to have happened was that a bit of the frosting had fallen off. I have full Jello boxes some with the Jello still in them. Hockey and baseball cards. I have full cereal boxes with cereal still in them and Kraft Macaroni and cheese without the contents. I have a couple dozen Topps Gum tabs and a number of their early card issue penny packs from 1939-49 with the gum still intact-it's basically inert. Add a little more sugar though, like my late 50's/early 60's Bazooka packs and things get messy, so anything sweet might be a problem no matter what the packaging. I once opened a box of dry pasta and found about a dozen weevils busily consuming the product. It had only been in the cupboard for about a month, so you never can tell about shelf life - you might want to start checking your collectible comestibles on a regular basis. I miss hunting for the food issues, absolutely no one does this anymore.. The only times I would go food shopping with my mom was to search the Wonder Bread rack for the Dolphins cards. Yeah, I've wondered about that. I've had them for years, and so far no indication of a problem. By now they're probably too dried out to be an issue (I hope!). You would never catch me back then in a grocery store but trying to complete my '86 Jiffy Pop set lacking the Gooden haunted me all summer. I had so much of that stuff It still makes me sick.. I finally traded a complete 85 topps set for it the next year but got a 86 Donruss with it. Definitely miss RC cola cans, opening up a box of cereal and pulling out a 3D card or looking for a good player on a box of Twinkees. Probably costs them too much to use the player or team likeness and maybe it doesn't even pay off in the long run if they did pony up the bucks? I was into the Nissen bread set as a kid. As a huge Braves fan in my childhood, I was thunderstruck to find a package of cookies in a mom-pop grocery store with terrific cards of Braves players attached. My mother had brought me along just to lug bags, and was really annoyed that I desperately begged for the cookies. To this day, I remember the smell and taste of Johnston Cookies and wish I had been old enough in 1954 to go back to that little corner store and buy up their entire stock of them. Bruce, you beautifully expressed one of the facets of the regional / food issue gems---"I had so much of that stuff It still makes me sick..". I definitely brought out that concept in my book on immediate post-war regional / food issues, NEVER CHEAPER BY THE DOZEN. For me, it was Kellogg's Raisin Bran. Their 3-D cards were beautiful enticements, but it took me 40 years before I found them appetizing again!!!!!!!!!!!!! I truly miss the gorgeous regional / food issues as well. The major trading card companies have the exclusive rights to produce cards. Furthermore, they have paid the piper handsomely for the rights to show any of their respective team emblems. I understand those licenses are flat out prodigiously EXPENSIVE. Panini secured the rights from the Mickey Mantle family to produce cards of him. Sadly, Panini does not have the licenses to produce cards with New York Yankee emblems, rendering them as a beautiful Bengal Tiger with its teeth yanked out. Appalling. Steve, I would have loved to have interviewed you for my book on immediate post-war regional / food issues, NEVER CHEAPER BY THE DOZEN. I find your remembrances of the Johnston Cookie cards enchanting, as I also the perfect reprints you ever so skillfully made and gave me as a present about 3 years ago. Thank you ever so much!!!!! I was so touched; they're magnificent. Yeah, you are so right. If we all could be granted three places to go back in time to get certain cards from some non-gum promotion that were usually not easy to get at the time the window was open for purchase. Thanks for sharing your eloquent memories, brother. Have a great day, sir. My dad hoarded boxes of Post Cereal in 1990. There were literally dozens, possibly hundreds of boxes stacked in his card room. At first, it was amazing. My brothers and I had an endless supply of Lucky Charms, Honeycomb, Sugar Crisp, etc. I haven't eaten any of those since, and probably never will. Successful transactions with: greenmonster66, jfkheat. Wal-Mart Pizza included some cards last year. And if you want the Sandlot players from the movie, they're included in the DVD/Blu-Ray boxed set, I've been told. The biggest one I remember growing up was the gasoline company that was giving away packs of 1992 Fleer baseball with fill-ups. And this year, Winn-Dixie was giving away 2 Star Wars "cosmic shells" for every $20 in groceries you bought. 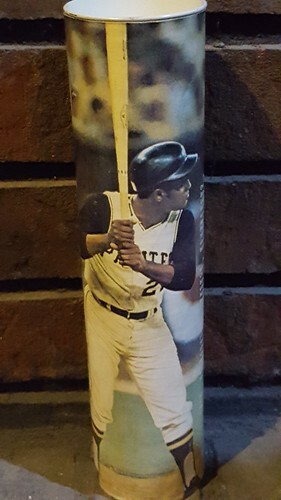 This is a Roberto Clemente bank that was made by Caruth Candies after his death in 1972. It still has the original candy in it. How about a full half gallon waxed paper carton of milk with a Lake To Lake Dairy card stapled to it! Probably none of those around. Even if you could have cryogenically frozen it back then, and thawed it now, it would still be enough to knock you over if you were silly enough to drink it. I have liquor decanters with the seal intact and the contents inside. Much like the item above, it raises an interesting question of being able to sell alcohol when you try and unload it. My guess is it would be illegal for me to sell the decanter unless I emptied it. Correct? Usually it's ok as long as you're selling to an adult. Now if you had an entire pallet of those......that might be a bit different. The rule in most states is that you can sell it as a collectible if the value of the collectible is much higher than just the liquor inside. Like, my sister has a bottle of Absolut Vodka (worth like $15 right in liquor) that is worth $400 or so because the artwork was by artist Romero Britto. That could be sold full to an adult because it has a collectible value over the liquor inside. I collect '71 Milk Duds in complete boxes. I can't imagine owning an unopened box of Milk Duds but I am sure there are some out there. Most collectors that collect Milk Dud boxes buy them empty and flattened (typically graded, but not always). I love these food issues uncut and still in their natural habitat! I picked up a few of the empty complete Milk Dud boxes a few years back - seems strange to me that these turn up and are not terribly hard to find - I can't imagine little kids eating the Duds and then carefully unfolding and putting these away to keep them nice, especially in 1971, probably a good 10 or 15 years before the condition sensitivity of the hobby kicked in. Does anyone recall if a stock of unused boxes was found at some point? Despite the lack of color, I think they are pretty cool! I'm pretty sure The one I have is unused. When I bought mine they weren't all that uncommon. I should have bought more of them.